Did Benedict XVI Ever Rejected his Progressivist Past? 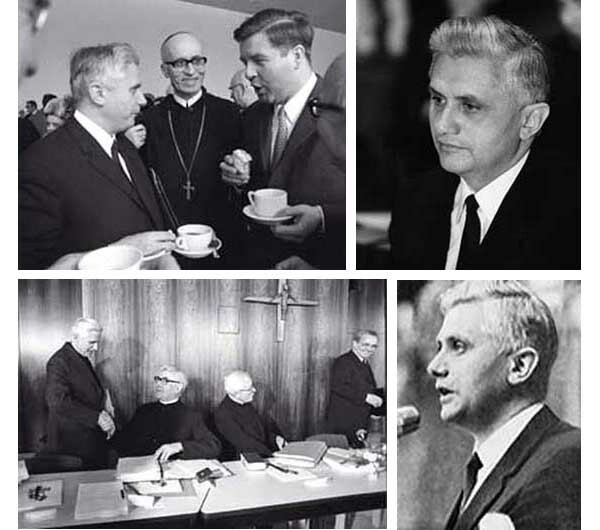 Did Pope Ratzinger Ever Reject his Progressivist Past? Above, Fr. 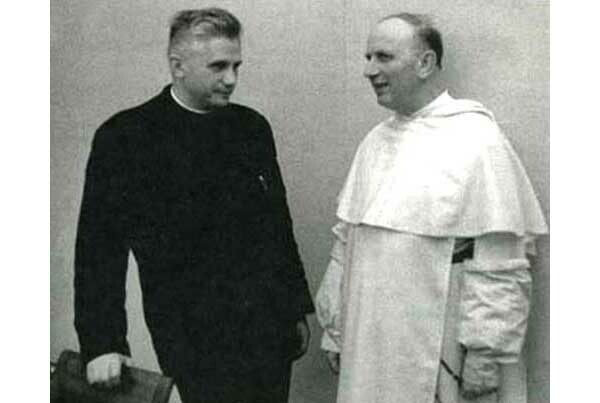 Joseph Ratzinger in his late 30's poses with Fr. Yves Congar when they were periti [experts] at Vatican II. Both had been placed on the list of those under suspicion of heresy by the Holy Office during the Pius XII pontificate. One of the "novelties" of John XXIII was to invite the two theologians, along with other members of the Nouvelle Theologie [New Theology], to act as periti at Vatican II even though the suspicion they were under had not been lifted. The same group became the inspirers of the main documents of the Council which were promulgated by Paul VI. Several times afterward, then-Cardinal Ratzinger was asked if his convictions had changed since the time of the Council; he always emphatically denied it. Today, when many conservatives believe that Benedict XVI has became a strong advocate of Church tradition, the question is more opportune than ever. Did he abjure his previous Progressivism? We would like to know, since we have some eloquent evidence to the contrary - see Related Topics at the bottom of the page. Below first row at left, Fr. Ratzinger in 1971, as a consultant at the German Synod in Wurzburg, talks with the Bavarian Minister of Education, Hans Maier, under the complacent smile of Cardinal Augustin Mayer; at right, as a university professor. Second row at left, greeting the directors at a Bishops' Conference in the city of Stapelfeld, Germany; at right, delivering a talk.